Gibran Tueni, the editor of Beirut's mass circulation An-Nahar daily newspaper, fired a shot heard around the world in March, in the form of an editorial calling for the withdrawal of Syrian troops from Lebanon. Tueni's editorial, the first by a major journalist to explicitly make such a call since 1990, inspired the hearts and minds of journalists, students, lawyers, human rights activists and other sectors of country's beleaguered civil society. In the stroke of a pen, their days of remaining silent passed into the history books. Tueni, 42, belongs to a family with a long tradition of journalism and public service. Al-Nahar was established by his grandfather in 1933. His father, Ghassan Tueni, ran the newspaper for decades, served in parliament, the cabinet, and represented Lebanon at the United Nations. Tueni was instilled with the principle of sectarian tolerance at an early age due to the intermarriage of his parents (his father was a Christian, his mother a Druze), which was virtually unheard of at that time. At age 18, he came to experience the horror of sectarian intolerance with the outbreak of the Lebanese civil war in 1976--he was shot in the legs by Palestinian guerrillas later that year and kidnapped for 36 hours by Christian militiamen the following year. Tueni was an outspoken participant in the multi-sectarian, populist movement backing Prime Minister Michel Aoun's 1989-1990 attempt to expel Syrian military forces from Lebanon. After the Syrians occupied Beirut and ousted Aoun in October 1990, Tueni spent three years in exile in France. After his return to Lebanon, Tueni joined his father at Al-Nahar, which managed to flourish despite the new Syrian-installed regime's efforts to silence the press. In December 1999, Tueni succeeded his father as managing editor of the paper. "It is a pity that someone who calls for the minimum standards of sovereignty and independence for his country is accused of treason," said Tueni in response to the avalanche of criticism by pro-Syrian politicians. "My editorial was an address to Colonel Bashar Assad and a criticism of the Lebanese politicians who exploit Lebanese-Syrian ties to serve their interests. Those who responded negatively are those who felt targeted by the editorial and felt the need to defend themselves. They do not seem to have read my editorial. "5 Bashar Assad did not publicly comment on Tueni's article. Within days of its publication, however, he summoned Lebanese Prime Minister Selim al-Hoss to a meeting in Damascus and no doubt expressed his thoughts on the matter. As a result of the April intifada by supporters of Aoun6 and the withdrawal of Israeli forces from Lebanon in May, the willingness of Lebanese civil society to challenge Syrian authority has continued to grow. As perhaps the most eloquent advocate of his country's sovereignty and freedom still residing in Lebanon, Tueni will play instrumental role in Lebanese political developments in the coming years. 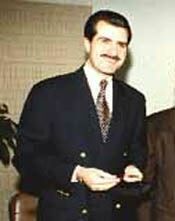 1 Open Letter to Bashar Assad, Al-Nahar (Beirut), 23 March 2000. Republished in The Middle East Intelligence Bulletin, April 2000. 2 L'Orient-Le Jour (Beirut), 27 March 2000. 3 The Daily Star (Beirut), 29 March 2000. 4 Al-Nahar (Beirut), 27 March 2000. 5 The Daily Star (Beirut), 27 March 2000. 6 Lebanon's Intifada, The Middle East Intelligence Bulletin, April 2000.